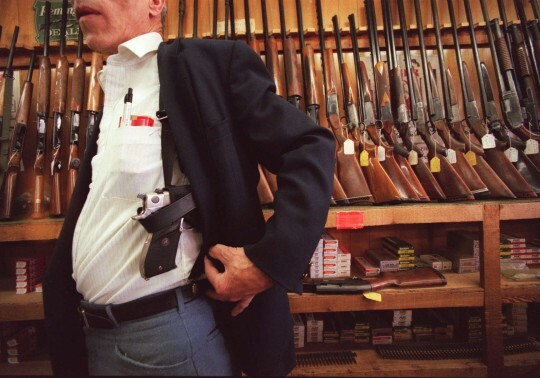 A federal judge struck down part of D.C.'s gun carry law as likely unconstitutional on Tuesday. District Judge Richard Leon, a George W. Bush appointee, said the city's requirement that applicants prove they have a "good reason" to carry a firearm beyond self-defense violates the Second Amendment as interpreted in the landmark Heller decision. "In Heller, the Supreme Court unequivocally asserted that ‘the enshrinement of constitutional rights necessarily takes certain policy choices off the table,'" Leon wrote in the ruling. "The District's understandable, but overly zealous, desire to restrict the right to carry in public a firearm for self-defense to the smallest possible number of law-abiding, responsible citizens is exactly the type of policy choice the justices had in mind." "Because the right to bear arms includes the right to carry firearms for self-defense both in and outside the home, I find that the District's ‘good reason’ requirement likely places an unconstitutional burden on this right." The ruling is another in a long line of rulings by federal judges against various D.C. gun laws. The current law, which operates on a "may issue" framework, allows D.C. officials to deny permits to those who pass the required background check and training so long as they determine the applicant doesn't have a "good reason" to carry a firearm in public. The city of more than 600,000 had only issued 62 gun carry permits as of March 9. Washington's restrictive gun carry law has been the subject of multiple lawsuits since the city's previous total ban on the carry of firearms. The Second Amendment Foundation's case against the law is awaiting another round in federal appeals court after a rollercoaster ride through the federal court system. The suit ruled on by Judge Leon on Tuesday was brought by another gun rights group named Pink Pistols. Pink Pistols, which advocates for gays, lesbians, and other sexual minorities to legally arm themselves as a means of self-defense, joined Matthew Grace in suing the city after his application for a gun carry permit was denied under the "good reason" clause. "This is not a want," Gwendolyn S. Patton, head of Pink Pistols International, said. "This is a need. This is a right that we have and we are going to exercise it. We wish to exercise it legally and therefore we're going to challenge this idea that you have a right to tell us what is a sufficient cause for us to carry a gun." She said that sexual minorities can face violence from some who disagree with their lifestyles, and accordingly Pink Pistols believes armed self-defense is essential to the safety of their community. "There's an awful lot of instances where we get targeted by people who don't like us, don't like what we do, don't like what we stand for, don't like our politics," Patton said. "They don't think we have the right to go about our lives in a normal fashion and decide to harm us, to attack us, to hurt us, and, in many cases, to kill us. This is unacceptable to us so we advocate the use of the Second Amendment to protect ourselves from such things." "We don't go out seeking any trouble," she said. "We just go about our business. But the point is some of us may be armed, trained, and ready to defend ourselves if someone intends to cause us harm." The Metropolitan Police Department would not comment on the ruling and referred all questions on the matter to the Office of the Attorney General. Robert Marus, communications director at the Office of the Attorney General, said the city is currently considering what to do in response to the ruling. "The ruling enjoins the District immediately from denying concealed carry licenses to applicants who meet all eligibility requirements other than the requirement that the applicant demonstrate a ‘good reason to fear injury to his or her person or property' or ‘any other proper reason for carrying a pistol,'" he said. "We are currently reviewing the decision and will make a determination on any appeal or motion to stay the decision soon." Update 6:14 P.M.: D.C. Attorney General Karl Racine said the city would request a stay on Tuesday's ruling in addition to filing an appeal. "We continue to believe our ‘good reason’ requirement for a concealed-carry permit is both constitutional and in line with similar laws in New Jersey, New York and Maryland – all of which have been upheld by federal appeals courts," he said in a statement. "Just two months ago, another judge on the U.S. District Court for the District of Columbia declined to enjoin the District from enforcing the same requirement at issue in today’s ruling. We believe that the District’s gun laws are reasonable and necessary to ensure public safety in a dense urban area, and we will request a stay of this decision while we appeal."